Details WARNING! CONTAINS ARSENIC. Please read the MSDS for cautionary statements. Orpiment is yellow arsenic sulfide, usually described as a lemon or canary yellow or sometimes as a golden or brownish yellow. It is designated as brilliant yellow in Munsell notation 4.4Y 8.7/8.9. Our orpiment is made from natural mineral sources near Kadamdzhay in Kyrgyzstan and is an intensely bright pigment of crystalline particles. It is an historical pigment having been identified on ancient Egyptian objects and paintings from the thirty-first to the sixth century B.C. It is mentioned in Greek and Roman literary sources. The Hellenistic Leyden papyrus described its use for late Egyptian painting, as does the Mappae Clavicula for early mediaeval painting. The pigment has been described in various other medieval manuscripts dating from the 12th to the 15th centuries. Orpiment is a rare mineral that usually forms with realgar. In fact the two minerals are almost always together. Crystals of orpiment are extremely rare as it usually forms masses and crusts. The masses are sometimes transparent to a degree and have a gemmy quality to them. The yellow color is special to orpiment and can be confused only with a few other minerals. Orpiment is derived from the latin auripigmentum, or "golden pigment." The largest quantities of orpiment were found in Turkish Kurdistan (Julamerk), and in the Russian republic Georgia. The orpiment in Italian painting often came from the fumaroles of mount Vesuvius and from the Campi Flegrei in Tuscany. Since the later Middle Ages the pigment was also artificially made. This pigment would most likely be the result of sublimation of arsenic, or arsenic oxide and orpiment with and without the addition of sulfur. Notable occurrences of orpiment are found today in Kyrgyzstan; Romania; Peru; Japan; Utah, USA; and Australia. Early authorities usually described orpiment as fading readily, or at least to some degree on exposure to light. It is said to be incompatible with lead- or copper-containing pigments. Molart studied the mechanisms of deterioration in orpiment. Several medieval painting guides do not recommend mixing orpiment with lead white, red lead or verdigris. However, it must also be noted that it has been identified in paintings mixed with indigo, red iron oxide, azurite, Prussian blue, green bice (artificial malachite), and bice (smalt). It cannot be applied to wet plaster, and hence is not recommended in wet fresco painting techniques. 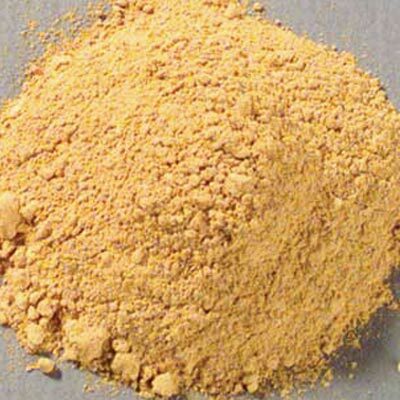 No data has been published on the oil absorption properties of orpiment. It is difficult to grind because of its micaceous structure. For this reason, it is often quite coarse. It has been suggested to add ground glass to the pigment to facilitate grinding and dispersion in linseed oil. The toxicity of arsenic sulfide pigments has been known for years. Extreme caution must be used when handling the dry orpiment pigment, as well as in any soluble form, to avoid inhaling the dust or ingesting it.